Our Visa Card has an annual percentage rate of 10.90%. We have a simple application form to fill out. Our loan officers can have you approved the same day and your card should reach you in 7 to 10 days. If you are a recent graduate or college student wanting to start building your credit, this is a great way to start. Our loan officers can open your card with a minimum of $500.00 to start. If you currently have a credit card with a much higher interest rate, come see us about a consolidation loan first and then we'll talk about getting you our lower rate Visa Card. EFFECTIVE DATE: The information about the costs of the card described in this application is accurate as of December 1, 2014. This information may have changed after that date. To find out what may have changed contact the Credit Union. FOR CREDIT CARD TIPS FROM THE CONSUMER FINANCIAL PROTECTION BUREAU: To learn more about factors to consider when applying for or using a credit card, visit the website of the Consumer Financial Protection Bureau at http://www.consumerfinance.gov/learnmore. Looking for the perfect gift? Anniversary, Baby Shower, Birthday, Christmas, Graduation, Hidden in an Easter Egg, House warming gift, Wedding. You name it, it works! Visa Gift Cards are available at our office for only $2.00 per card. It can be used most anywhere a Visa debit or credit card can be used. AFCU Visa Gift Cards are available in any amount between $20 and $500. Note: Cards cannot be used at ATMs, hotels, car rental or pay-at-the-pump gasoline transactions​. If card is not used for 12 consecutive months, the 13th month a $5.00 fee will be deducted. If the card is lost or stolen a $10.00 replacement fee is required.To close the card with cash out requires a $10.00 fee. Third Party fees may apply except where prohibited by law, this Card is valid through the expiration date shown on the front of the Card or until the Funds' balance reaches zero. The expiration date for the underlying Funds is 5 years after the date the Funds are loaded or the Card expiration date, whichever is later. Our Pre-paid Visa is GREAT. If your sending your child away to college, camp, etc... You can add money to it whenever they need. Unlike cash, if they lose it, shutting it down is only a phone call away. The balance can be placed on a new card. Online Shopping, Great, the funds aren't attached to your checking or savings account. The only accessible funds are what you have on the card. 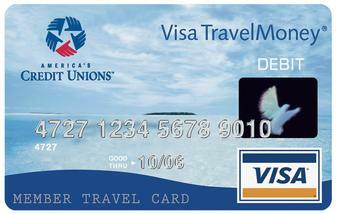 Pre-paid Visa cards are $6.00 each with a minimum of $100.00 to a maximum of $5,000. USING YOUR CARD: If you transfer funds from your account to place on your card at www.CUMONEY.com or by calling 1-877-850-9650 there is a 3 to 5 day hold on funds transferred. For merchant PIN Transactions you may make twenty -five (25) transactions per day with a $2,500.00 daily maximum or Your Funds Balance, whichever is less. For merchant signature purchases, You may make 25 transactions per day with a daily maximum of $5,000.00 or Your Funds Balance, whichever is less. You may request 2 cash advances per day, with a maximum $1,000.00 daily limit. CUSTOMER SERVICE: To check Your Funds Balance or review recent transactions, You may visit www.CUMONEY.com. You may call toll-free 877-850-9650 24 hours a day, 7 days a week.